By popular demand, here's a video I made highlighting some of the cards from my personal collection. Baltimore is a great place to pick up dance moves, I find. It's also a great place to have a baseball card show. Tuff Stuff is reporting that the National Sports Collectors Convention might be coming to the Charm City in 2010. Yes, Baltimore is the Cleveland of the Northeast; but it's only two-hours drive from me, and that's all that matters. Take one guess as to who paid $401.99 for the Johan Santana fake no-hitter gimmick card? Well jumping Jesus on a pogo stick, get a look at this! It's Kosuke Fukudome's first Major League Topps card! Of course, its STILL NOT A REAL ROOKIE CARD, but who cares, right? OBTW, the checklist on topps.com still lists card #645 from the 2008 Topps baseball set as a non-existant Kosuke Fukudome RC. The boycott continues until the gimmicks and deceptive marketing practices cease. If there was an award for "Rookie Cardblogger of the Year," then Gellman of Sports Cards Uncensored would be a cinch to win it this year. You may not like his style, you may not agree with all his takes, but his blunt frankness and brutal honesty have been a welcome addition to the cardblogosphere. For an example, check out this must-read post where he calls out the scourge of The Hobby and the guy who has single-handedly made the Beckett newsgroups unreadable for the last five years: "Joe Collector." Vacation's over, and nothing in The Hobby has changed in my absence. The big story is (I suppose) Topps and Upper Deck suing each other (again), over something-a-ruther. So I'm back now. Not quite tanned, not quite rested, and not quite ready. And just for the hell of it, here's an old Public Image Limited video from the 80s. Enjoy. ... Jay Bruce is the first of Topps "Red Hot Rookie" gimmick redemption cards. THERE IS STILL NO KOSUKE FUKUDOME ROOKIE CARD IN 2008 TOPPS BASEBALL! #2) Whatever you do, never, ever, go on vacation with your parents. I don't care if they're paying for it. I don't care if it's a "gift" for your graduation from college. Trust me, it's just not worth it. #3) Never, ever, find yourself in Killarney during bike week. Unless, of course, you ride a Harley. In that case, you'll fit right in with this crowd. #4) Never, ever, stay at a hotel that charges for wi-fi. #5) Never, ever, drink five pints of Guinness, get into a fight with your brother, and then go back to your hotel and blog. By the time Blogger (hopefully) gets around to posting this, I'll be on a jet plane. Vacation, baby! Ten days of drunkenness and debauchery with my two little brothers in Ireland! Come to think of it, this is the first real vacation I've had since that 120-day tour of Saudi Arabia back in '97. Needless to say, the output of this blog will be noticeably reduced for the next few weeks. I'm bringing my laptop, so I should be able to keep up with what's going on in The Hobby. And if Topps of Upper Deck do anything stupid, rest assured, I'll chip in my two euros from the other side of The Pond. In my rage over Topps bait-and-switching the Kosuke Fukudome RC, I passed overlooked this. I'm not as angry with Upper Deck with this one because, after the series one Hillary fiasco, I think we all were expecting that they'd pull a similar stunt. I'm also not as angry because, unlike the Kosuke Fukudome gimmick card (which, BTW, is still listed on topps.com as base set card #645), both versions of these cards were posted to the checklist on upperdeck.com. That and, again, unlike the Topps Fukudome, it does not compromise the integrity of the base set. But just because I'm not as mad, it still doesn't mean I like it. I'm more disappointed than angry over this one. Upper Deck has still not confirmed the existence of this variation. But I guess if you absolutely have to lower yourself to gimmicks, then short-printed variations (which do NOT compromise the base set) are the way to go. The Johan Santana card in this picture is card #661 in the 2008 Topps baseball set. 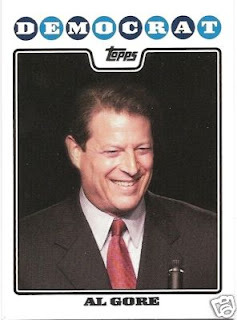 (And to think, you actually thought there were only 660 cards in the Topps set?) According to the eBay auction -- the only one of this card offered so far -- card #661 "commemorates" the "no-hitter" that Johan Santana "pitched" for the Mets on September 28, 2008. Yes, it says September 28, 2008.